Okay, so like “Bane Week” was supposed to end on Saturday. Oops. Anyway, it’s Monday morning, I’m feelin’ good and I’m ready to conclude IAT’s look at DCUC16 with a look at Bane! Well, mostly ready. This might take a couple cans of Dr Pepper to get through. It’s 5am and I’m just getting started. With Green Lantern Classics 2 being found in Wal-Mart’s ’round the country, I thought it best to plow through my backlog of DC Universe Classics reviews last week and get 16 wrapped up in record time. And “Bane Week” was a success, other than not getting wrapped up exactly on time. I’d say you might look forward to a “Stel Week”, but it certainly doesn’t sound exciting, does it? Maybe “Green Lantern Week” so we can get some of that movie tie-in traffic… Anyway. Bane is a character that I love or hate depending on the writer. Initially, he was an all-out villain. He was created by Chuck Dixon, Doug Moench, & Graham Nolan in ’93 as an “evil Doc Savage”. He would break Batman’s back within the year and instantly be catapulted into the top ranks of Bat-villains. His origin was relatively simple, his father had fled the country of Santa Prisca to avoid a prison sentence and the courts imprisoned his son as a substitute. Bane, a small child at the time, was raised to adulthood in the prison and ultimately became the “king” of the inmates. The prison would later use Bane as a test subject for an experimental drug called Venom. It had been fatal for all the previous inmates, but Bane’s physique and strength of will allowed him to survive. He quickly discovered that the drug greatly increased his physical strength which he used to break free from the prison. His obsession with Batman led him to Gotham City where he broke Batman’s back, Azrael nearly killed him for his trouble, and he ended up in Blackgate prison. This, to me, is where Bane gets interesting. He gets clean and free of Venom, turns a little anti-hero, and begins searching for his father. He’s featured in a great run of Gotham Knights by Scott Beatty, but this take was short-lived. Geoff Johns absentmindedly had him back on Venom and snapping spines again just a few months later. Crap. A few more Bane stories like that would follow, but fortunately for Bane (& for me) Gail Simone adopted him into the Secret Six back in 2008. His appearances there are more in line with his anti-hero persona and he’s been getting some great stories and characterization ever since. For most of the longtime DC Collectors, we’ve had a placeholder Bane in our collections courtesy of the DC Superheroes line, though DC Direct had a decent version as well. My original DCSH Bane broke after a shelf fall (and Vault’s mysteriously exploded at the bottom of a toy bin, so the only comparison shot we have is the much maligned “Camo Bane” from that line). The new collect & connect Bane makes most of your other Bane toy’s obsolete, though the one advantage of having the older DCSH figure around is that some of them came with an accessory of Bane’s one true friend, his childhood teddy bear, Osito (knife not included). Bane’s height is debatable. He’s generally listed at 6′ 8″, but if you’ve seen any Bane artwork, you know comic artists love to draw him in a variety of sizes, some much, much larger. It’s in that regard that I say the Bane presented here, at around 8″ is probably just right. I wouldn’t complain if he was a little smaller, but this height has a good dynamic with the regular size figures. It works. Bane was the only reason I wanted Creeper, Mercury and Jonah (though I’m warming up to Jonah). He looks so fantastic going toe-to-toe with AzBats. My Bane seems to have a glued-shut ab crunch though. Anyone else had that? I tried tossing him in the freezer, but no avail. Still, I love the figure. Most pictures really don’t do the figure justice, especially in the torso (yours were pretty great though!). I’m waiting on Riddler and AzBats to come in. Then my Bane will be complete! Mwahahaha! After struggling with the head for a couple of minutes, I had to heat it up, too. when they get around to doing a real, huge, all jacked up bane, wake me up. i get why some folks have an affection for a slightly more normal bane, but to me, for the figure itself, i prefer the huge distended jacked up look, ala the arkham asylum bane… though i do think the DCU one will have the distinct advantage of being able to stand up straight. that DCD AA bane all hunched over permanently makes my back hurt just looking at him. oh, and why the riddler bigger than batman? outside of the jim carrey version, when has that EVER happened? Riddler ended up being bigger than bats because of the pelvis they used. Since it has the belt slot, he ends up taller. Same with any other figure that uses a belt. I’m sensing inevitable scale creep. NO REASON why Riddler (or Creeper) should tower above Superman & Batman. I’ll be happy to get him, but part of me wishes that they’d used a bulkier body for the base of this CAC – maybe another re-tool of the Kilowog base? All I’d really be after is a little more size and some bigger arms, though I’d think that buck would be too big in scale. Bane wanted to break the Bot-man. Optimus Prime didn’t want to be broke. Great pictures as always. 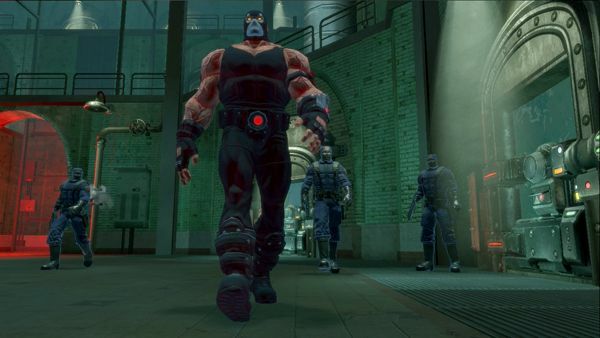 I find this Bane resembling the one from DC Universe Online a lot in terms of proportions which is interesting, but I’ve never been a big enough fan of Bane to care much. I just find it really creepy that he randomly decided the most naked woman he could find is his adopted sister. It’s lucky he didn’t team up with Poison Ivy or Bruce Timm would’ve had Harley and him fight to the death a long time ago. Thank you, good citizen. Sometimes the obvious proves to be an elusive beast. It was probably just cheaper to do this than retool the DCSH Bane with new legs and artic (which is fine, that’s business). And if it was more expensive to make this cnc version, then everyone responsible at Mattel needs to be hit with a giant inflatable hammer. Rickcoronel, doesn’t Batman have a belt too? And Creeper has no belt?!?! Are u saying the hip part is taller or that having a belt makes em taller? Cause the latter doesn’t make sense. Probably try and build this dude eventually . . .